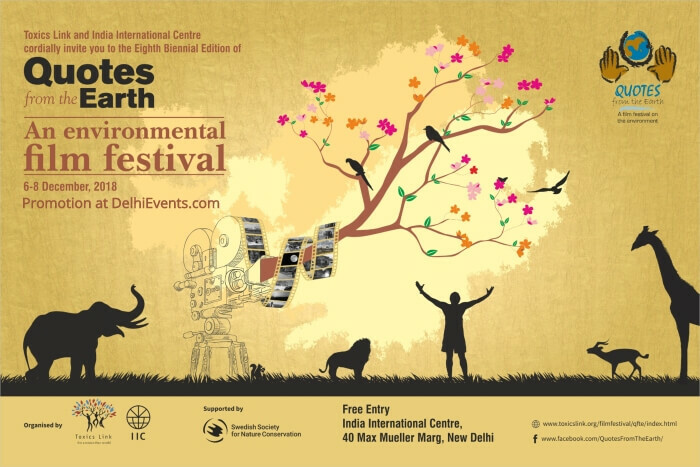 Toxics Link and India International Centre with support from The Swedish Society For Nature Conservation is organising the eighth edition of ‘Quotes from the Earth’ – an Environmental Film Festival. The festival aims to sensitize the lay man towards the critical environmental issues plaguing the world today. This year as many as 28 films will be screened during the festival which includes award winning films like ‘The Pangti Story’ by Sesino Yhoshu and 'The Birdman of Chorao'.‘Quotes from the Earth’ is one of the oldest environmental film festivals in the country and has been organized in the Capital since 2004.Apart from thought-provoking films by renowned Indian environmental filmmakers like S. Nallamuthu, Gautam Pandey, Doel Trivedy and Jalal Ud Din Baba, film viewers will also get to watch internationally acclaimed films from countries like Russia, Turkey & The Dominican republic. About the Organisation: Toxics Link is an environmental NGO founded in 1996, engaged in disseminating information to help strengthen campaigns against toxic pollution, provide cleaner alternatives, and bring together groups and people concerned with, and affected by, this problem.